Options are one of the most fascinating and versatile financial instruments. While trading in stocks or commodities, you can bet on only one thing, i.e., the direction of the price. You simply buy when you are bullish and sell when you are bearish. It means that for making money while trading stocks, you need to successfully predict or anticipate the future direction of the price, which is one of the most difficult tasks. But that’s not the case with options. Options let you play not only on the direction of the price of an underlying asset but also on time and volatility. Besides it, the huge amount of leverage it provides makes it one of the greatest games ever. And the good news is, we have created a completely automated options strategy payoff calculator excel sheet. You just need to input the details of your options trade, and the excel sheet will calculate your maximum profit potential, probable risk and all other metrics related to your trade. Read on to know more. Why should you trade Multiple Options at a time? By trading multiple options simultaneously, you can create your desired options strategy. Options strategies provide complete flexibility to the traders to manifest their views about the market into their trading position. A trader can choose or build any options strategy based on his views about the underlying asset and also his own risk and reward expectations. With the right knowledge and tools in hand, there is absolutely no limit. And at Trading Tuitions, we are providing you both. Let me ask you a question. What’s the risk-reward profile of a long call option? Well, that’s easy. We all know that there is unlimited profit potential and the risk is limited to the amount of premium paid. But when it comes to complex multiple leg options strategies, such as Butterfly, it is difficult to analyze the profit-loss potential that quickly. A convenient and quick way to envision what happens with option strategies as the value of the underlying asset changes is with the use of a profit and loss diagram, known as a “payoff diagram”. Also Read: How to trade Options using Market Profile? What is a Payoff Diagram? Payoff diagrams are a graphical representation of how a certain options strategy may perform over a variety of expiry prices enabling a trader to gain an understanding of potential outcomes. These graphs help us understand the risk and reward for a particular options strategy at a glance. The vertical axis or Y-axis of the diagram shows profits or loss generated by a certain strategy on expiry, while the horizontal axis or X-axis reflects the price of the underlying asset on options expiry day. Looking at a payoff diagram for a strategy, we get a clear picture of how the strategy may perform at various expiry prices. By seeing the payoff diagram of a call option, we can understand at a glance that if the price of underlying on expiry is lower than the strike price, the call options holders will lose money equal to the premium paid, but if the underlying asset price is more than the strike price and continually increasing, the holders’ loss is decreasing until the underlying asset price reach the breakeven point, and since then the call options holders profit from their long call positions. Options Strategy Payoff Calculator: How to Use? Step 1: Download the Options Strategy Payoff Calculator excel sheet from the end of this post and open it. Step 2: Select the option type and input the quantity, strike price, premium, and spot price. Quantity should be negative if you are shorting a particular option. Step 3: Repeat step 2 for all the legs your strategy contains. Quantity for rest of the legs should be set to 0. For example, suppose you want to analyze the payoff of a 2- leg strategy. Enter the details in the first two legs and ensure that quantity for the rest of the legs is 0. Step 4: If your strategy consists of buying or selling stock or futures such as in covered call or protective put, enter its quantity, futures price and spot price in leg 5. If not, set the quantity to 0. You will automatically get payoff table and diagram along with the net premium flow and maximum profit and loss potential for your strategy. Step 5: If you want to know your profit or loss for a particular expiry price, enter it and you will get the profit/loss value if the underlying expires at that price. Click on the below link to download Options Strategy Payoff Calculator excel sheet. Once you open the sheet, input the values as per the above instructions and validate your payoff diagram. If we edit this sheet in Call / Put column, it automatically shows Zero, please suggest. Unfortunately, daily values are not possible in the current sheet as it would require calculation of greeks and it would be a whole new dimension. Maybe in future, we will try uploading such a sheet. Stay tuned. is the profit and loss showing in excel is amount or the premium..
how to add leg 5 and 6 ??? and one more thing we have to enter 1 lot or 75 quantity please let me know…. Well that’s up to you. If you enter 1 as quantity, figures shown would be for one single share. But if you want to analyse your position for the whole lot, you can enter the quantity in multiples of the lot size. Hi Rahul, the sheet shows the net profit or loss figure (before commissions) for your position. 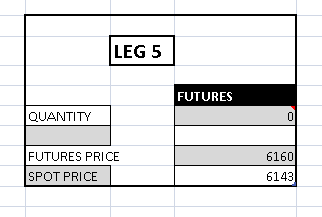 What is the future price to enter in Leg 5 for options? We don’t have any future price for Options right?